The deep relaxing oil massage is a fusion of Ayurveda, Thai (Yoga) massage, Foot Reflexology and Classical Wellness massage. With long strokes, flowing motions, and by connecting all body parts with each other, the nervous system will calm down. The outside world slowly fades away, and the body drops into a deep space of relaxation, where it can release any stored tension in the muscles, as well as in the emotional & energetic body. My warm hands, nurturing touch, and use of essential oils, will bring you in a deep relaxing state of being, where the body & soul subconsciously can process and release gained stimulus during daily life. The massage is very grounding, rejuvenates, and is a boost for the immune system. 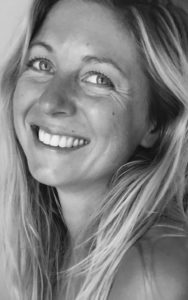 Annemieke Maria works as a masseur, and coach & mentor in the Netherlands and Greece. Specialised in High Sensitivity, and passionate about non-violent-communication, essential oils, and living with & in nature. Stimulating others to use their talents, and to reconnect our body & soul with our true nature, through nature.